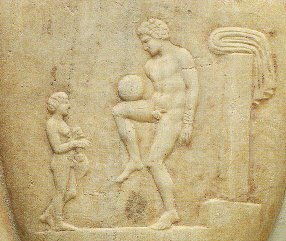 Very little is known about Greek ball games and their influence on modern-day football. It is claimed that the game of Episkyro was practised in Greece as long ago as 800 BCE. One of the basic rules was that you were allowed to use your hands, which really suggests that it is a closer relation to rugby than football. However many of the characteristics of the game are similar to football – particularly the dimensions of the pitch and the fact that 12 players formed a team. Another Greek ball game that many have claimed to be a forerunner of football is the game of Harpastron. Something worth considering is that Harpastron is the Greek word for handball and not football. Since the Greeks were the greatest intellects of their time, it is very hard to believe that they made such a fundamental error in naming one of their games. Hence we will put Harpastron in with Episkyro as a game more in keeping with rugby than football. However the greatest contribution made to football by the Greeks was that the Romans took the games of Episkyro and Harpastron and evolved them into a game called Harpastum. They also added the vital ingredient of kicking. The Roman game of Harpastum is considered by many to be a real forerunner to football.